Officially eliminated from the AFC playoff hunt, the Indianapolis Colts headed to Buffalo to take on the Bills and a blizzard, looking to end the last quarter of the season on a more positive note. As the Colts spent the week practicing outdoors to prepare for the colder weather, the players and coaches were in for a treat on Sunday against the Bills. Constant lake effect snow in Buffalo made game conditions nearly impossible for players and fans watching alike, in what would slowly become blizzard-like conditions. Despite all the snow, there was still a football game to be played, and one that meant nothing to the Colts and everything to the Bills. Both teams would combine for 161 yards passing, not exactly a surprise considering the conditions. However, running backs LeSean McCoy and Frank Gore would put on a show in the snow, with the Bills’ McCoy running for 156 yards and one touchdown, and Gore rushing for 130 yards, both on more than 30 carries. McCoy’s touchdown would come in the final minutes of overtime, defeating the Colts by a score of 13-7. 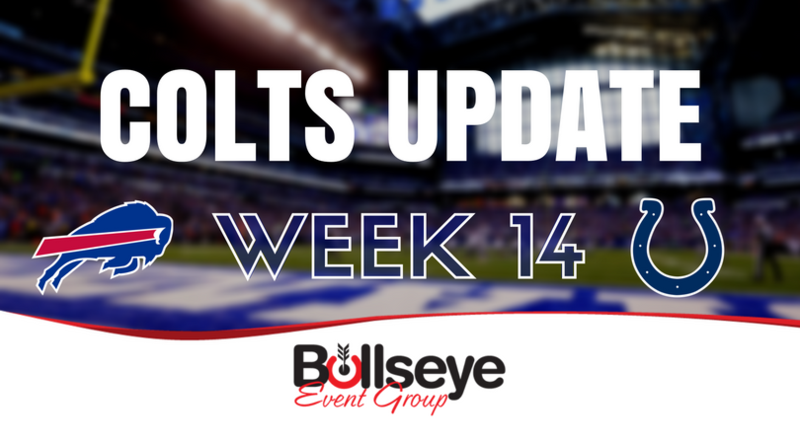 The Colts turn around on a short week in Week 15, returning home to take on the Denver Broncos on Thursday Night Football, before traveling to Baltimore in Week 16 to take on the Ravens on Christmas Eve. The Colts VIP Tailgates are BACK for the 2017 Indianapolis Colts season! With a new general manager and a re-shaped roster, the Colts look to start anew and make a triumphant return to the NFL Playoffs. Don’t leave your pre-game plans up to the Indiana weather. Get your 2017 Colts VIP Tailgate tickets today!